With Mitt Romney writing off 47 percent of voters, the Presidential race now comes down to the Koch brothers’ money and Paul Ryan’s ambitions. According to Forbes, the Kochs have budgeted to spend approximately $400 million in this election cycle, chump change to men worth $25 billion each according to the Forbes list of billionaires. To understand the Koch motivation to get Paul Ryan a heartbeat away from the Presidency, it requires listening to this brief tape, featured at the libertarian Cato Institute web site. On the tape you will first hear Herman Cain, the man the Kochs were backing for President last fall, pushing the privatization of Social Security. Next, you will hear from the global pied piper of social security privatization, José Piñera, a so-called Distinguished Senior Fellow at Cato Institute and Co-Chairman of Cato’s Project on Social Security Choice. The tape is a WNYC radio interview of the two men on the Brian Lehrer show on September 9, 2011. Listen carefully as Piñera tells you how wonderfully the privatization of social security in Chile has worked out. Piñera was the former Labor Minister in Chile under the brutal military dictatorship of General Augusto Pinochet. Piñera is spinning fiction; Cato is allowing him to do it; and the Kochs are hoping he can keep it up long enough to push through Ryan’s plan to transform the U.S. Social Security system into a maze of private accounts. What do the Kochs get out of this? Listen to Piñera explain that under private accounts, the employee pays both sides of the payroll tax for the retirement savings account. Under the current program in the U.S., the employer pays one-half of the Social Security tax. Like the Kochs, Ryan was born into an affluent family. Neither Ryan nor Romney seem to be aware that our Nation is still in the midst of the worst economic downturn since the Great Depression, a time when a government safety net is most needed. They are equally silent on the trillions in government handouts to those who caused the financial collapse, likely because they are collecting millions in campaign funds from those very Wall Street firms. 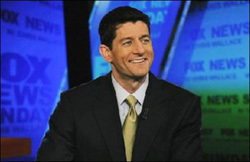 On January 27, 2010, Paul Ryan introduced H.R. 4529, legislation he called “A Roadmap For America’s Future Act.” The legislation proposed to create private accounts for Social Security and end Medicare as we know it. It was the Koch dream plan. The massive amounts of money the Koch brothers are putting behind a man who has promised to privatize Social Security solves one more mystery – the unprecedented actions that Charles and David Koch launched back in March of this year to protect their interests in the nonprofit Cato Institute. The Koch brothers filed a lawsuit in the District Court of Johnson County, Kansas (the state where Charles Koch lives and where Cato was incorporated) and revealed for the first time that this nonprofit was 50 percent owned by Charles and David Koch. If you’ve never heard of owners of a nonprofit, you’re in good company. As it turns out, Kansas permitted shares to be owned in Cato. The other two owners were Ed Crane, the long serving President of Cato, and William Niskanen, a long serving Chairman who had passed away. The Kochs were suing his widow, the organization and Crane, demanding that Niskanen’s 25 percent ownership of shares to be cancelled and thereby give them majority control at the Institute to name a majority of the Board. The battle for control of the Cato Institute blew up in the press with nasty accusations flying back and forth. Crane said the Kochs were attempting a “hostile takeover.” Many of the Cato bloggers sided against the Kochs. It was highly unusual for the Koch brothers to create such an unseemly public spectacle and people both inside and outside the Institute questioned their real motivation. In late June, the Kochs settled the lawsuit with Ed Crane agreeing to step down and the Kochs replacing him with their pick – John Allison, the former Chairman of BB&T Corp., a large bank headquartered in Winston-Salem, North Carolina. Cato is known for pumping out OpEds and white papers and heavily influencing legislation. With their men in the executive branch and their man at Cato, clearly the Kochs believe Social Security privatization is possible. According to a report from the Federal Reserve, as of 2010, the top 10 percent of Americans controlled 74.5 percent of America’s wealth. Charles and David Koch have a combined net worth of $50 billion. But their billions are apparently not enough. They would do to us what Piñera did to Chile just to stop the elderly and widows with children and disabled vets from having the security of their Social Security check each month. Charles Koch promised that this election would be “the mother of all wars.” The rest of us should not let him down.